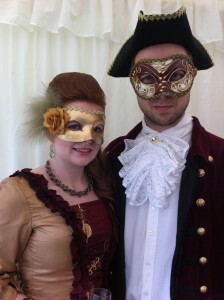 For those of you that follow my Facebook page, you will see that recently I attended a 3oth Birthday party in the theme of 18th Century costumes and masks. Luckily, I have the most wonderful seamistress who lives on my street. She only charges by the hour (a pittance if you ask me) and so after finding a gorgeous pattern for a Robe a la Francaise (i.e the dress with the long train coming from the neck), I then bought some beautiful (albeit expensive) silk dupion in an Ice Blue colour and gave it to her to decipher to make the overcoat. 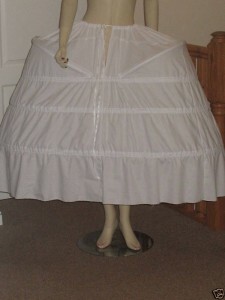 Now the underskirt of the dress was not done to the pattern. 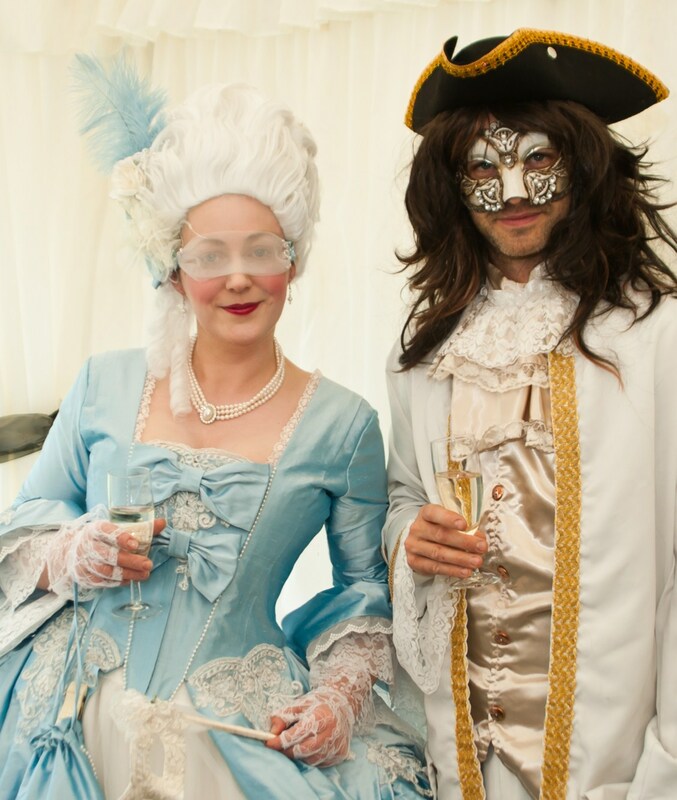 In face, I also had a wedding dress for my party in England (after our marriage in Venice) which was a period style dress with corset top, netting and a couple of underlayers. I stripped the corset top of all it’s lace, had it made into lace up back (6 years of marriage and I’m long passed a size 8 so needed some breathing room) and voila! The underskirt part to the dress was done. 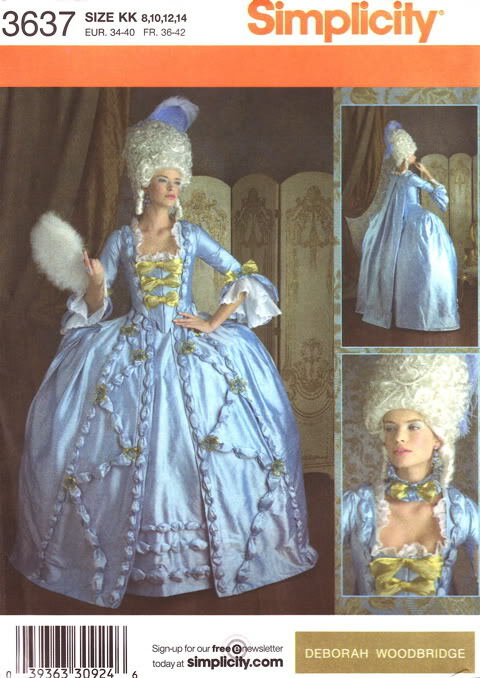 In fact I decided to keep it after seeing this image of Marie Antoinette (right) – as the bottom part of my original dress was just like it. I then used some of the lace on the overcoat (to match in with my underskirt) and decorated the coat with pearls, lace, ruffles and bows. Well when I said I decorated it, it’s more like I pinned it on how I wanted it and my poor seamistress did all the hard work. I’m forgetting the panniers! A ‘must’ for any authentic dress of this time. I bought mine off e-bay, but had I had more time & more money, I would gone for a wider 2 pocket panniers instead. I was out of time though as I could only find these in the US and there wasn’t enough time for posting them. 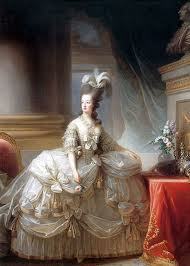 The reason being is that the dresses were supposed to be wide at the sides and flat at the front and back. 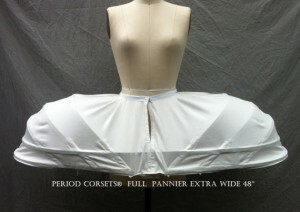 In fact my overcoat would take even wider panniers, so I tried to fill these out afterwards with extra netting. These would be have been ideal (bottom left) but are very wide and cost approx £215. (Available on Etsy). So I opted for the cheaper version (bottom right) which were about £70. Now they don’t look much from the image, but take out the bottom hoop & pull the drawstrings in (to flatten the front & back) and you get a lovely silhouette. You can also get through doors easily with these which is always a bonus to small panniers! Now onto my wig. Ah, what fun it was! I’m a bit gutted that I didn’t take photos along the way, but I have a spare wig that I might make another one from, so will do a separate blog on that next time. So I took a wig that I’d bought from my suppliers (which was the best cheap one I’d seen) and which had loads of spare hair hanging down the back, and brushed it gently up and around the main section, pinning and hairspraying it in place as I went along. You will see the outcome in my final photo, but it took some hours, lots of hairspray, baby powder and a glue gun to get it to how I wanted it. 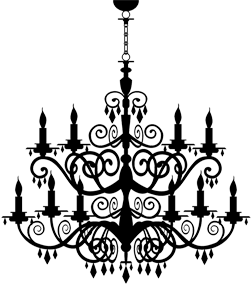 This is a site for masks, afterall, so last – but not least, are my mask designs. 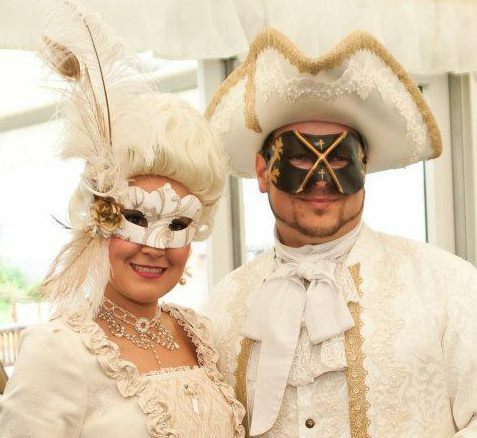 I always thought that I would struggle to choose what to make for a masked ball because I’m surrounded with so much inspiration, and I make so many for other people every day. In fact I ended up going with a stick mask because my wig was so full around my face that I couldn’t actally fit a big mask on anyway! My mask was decorated with parts of my wedding dress lace and netting but kept very simple. My wig was decorated with lots of flowers so I didn’t need a big mask to set it off. However, as I knew I wouldn’t want to be holding my mask up to my face all night, I decided to make a sheer lace mask that I could keep on all night. This was put on before the wig went on so the ties were all hidden. 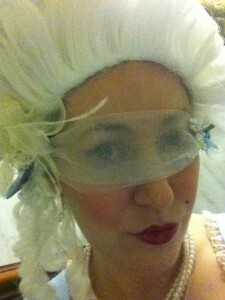 I had to use sheer fabric so I could still see through it as there were no eye holes (a la Kirsten Dunst in Marie Antoinette) but sewed on blue roses, pearls and crystals to match in with my costume. If you would like a mask making like any of the above (or any style!) 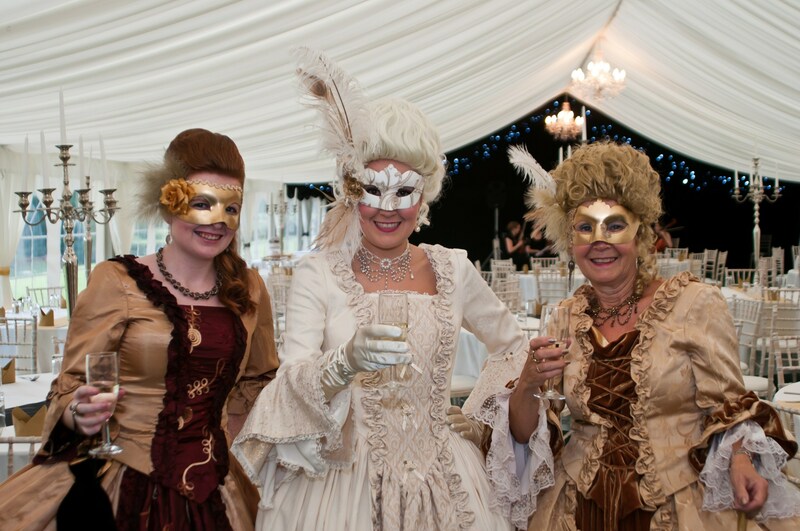 for a masked ball, prom, sweet 16, masquerade party or wedding – then e-mail me for further details. I ship many of my masks to the US, Australia, Canada & Europe regularly! These masks are truly beautiful. 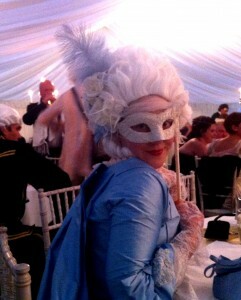 I love the 18th century dress to go with the mask. Using the veil with as a mask is an incredible touch.